Maxime Riché, Founder and President of Climate Heroes will be present alongside other prominent artists, directors and activists such as Olafur Eliasson, Cyril Dion (Director of the movie Demain), Luc Jacquet (Director of The March of The Emperor, The Ice and the Sky), etc. met during COP21 in Paris this past December. 2015 was an important year for the Climate Heroes project. As COP21 was held in Paris from November 30, to december 11, 2015, it also marked a turning point in the life of the project. 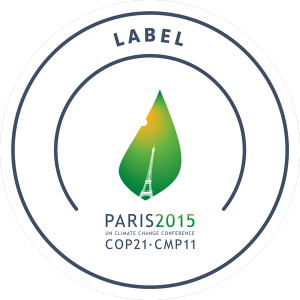 After 5 years of production all over the world, meeting amazing Climate Heroes and working together with photographers and journalists from many different countries, we were proud to receive the official COP21, Paris 2015 label in the fall. We were also selected to have a major exhibition in Grand Palais during one week. This would be the opportunity for the public to learn and get inspiration from the stories of the Climate Heroes. The Grand Palais is a prestigious museum and exhibition space in Paris. Its nave is about 13,000 square meters in surface area. 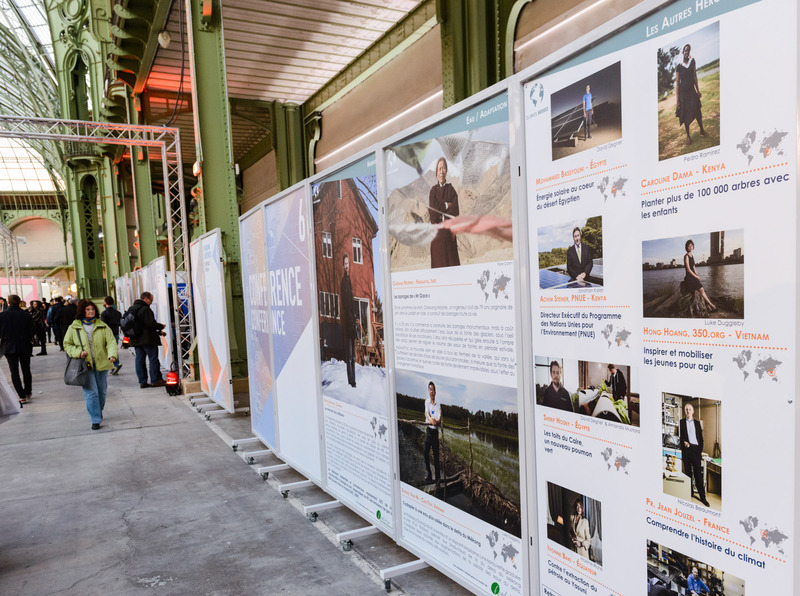 The Climate Heroes exhibition was presented on one side of the south nave, with 14 large panes, of 2.4 meters of height. This allowed printing the portraits of the Heroes very close to scale 1:1! 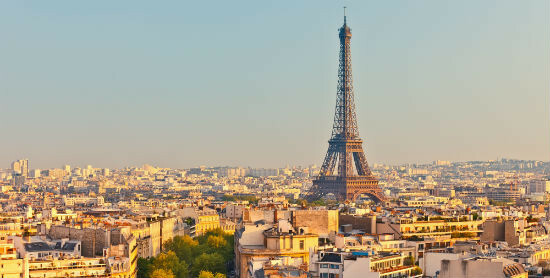 Over one week during COP21, the event welcomed about 40,000 visitors. We hope that one of our objectives (which was to bring inspiration to more of us about how to start acting to mitigate climate change) was reached thanks to this educational and artistic exhibition. The stories were also published in GEO France Magazine this December. It was a special issue dedicated to the environment, with 15 pages dedicated to Climate Heroes. Many thanks again to all of those who made it possible, from the contributing photographers, writers, and directors, to the project scientific partners, and sponsors. Climate Heroes est un projet documentaire et de vulgarisation scientifique regroupant photo, vidéo, et écrits, créé par Maxime Riché en 2010. Au fil des ans, il est rejoint par Luke Duggleby à Bangkok, puis d’autres photographes contributeurs et journalistes scientifiques, dans le monde entier. Climate Heroes raconte les histoires de femmes et d’hommes qui oeuvrent chaque jour dans le monde entier pour lutter contre les causes du changement climatique, en comprendre ses conséquences, et mieux nous préparer à nous y adapter. Citoyens, activistes, scientifiques, ou entrepreneurs, ces Héros du Climat préparent le monde de demain. Porteurs d’exemples positifs et de solutions, ils ont le pouvoir d’inspirer le plus grand nombre d’entre nous à agir, à notre tour. Depuis 5 ans, l’équipe de Climate Heroes va à leur rencontre pour proposer une nouvelle vision positive, moins anxiogène, et favoriser la prise de conscience et l’implication du public, en partageant ces histoires avec le plus grand nombre. Ce faisant, nous choisissons de porter un message fort et positif. 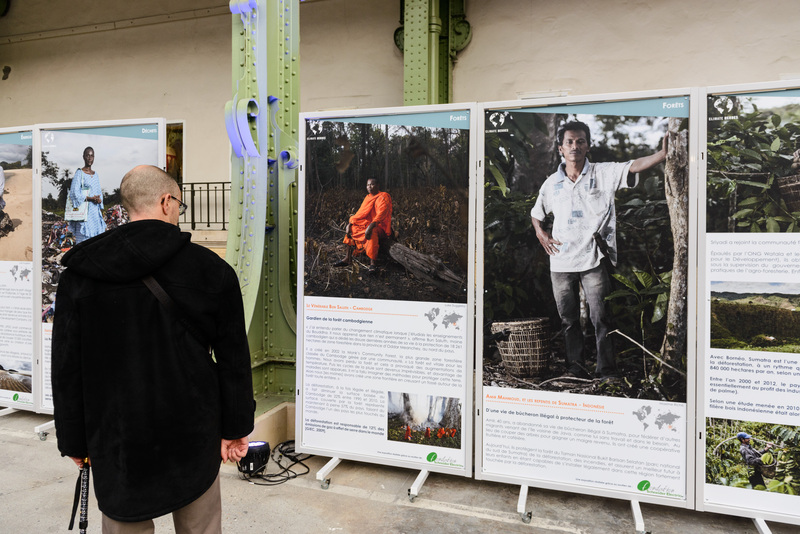 Maxime Riché est Artiste en Résidence au Grand Palais pendant Solution COP21 avec une exposition photographique Climate Heroes soutenue par la Fondation Schneider Electric. 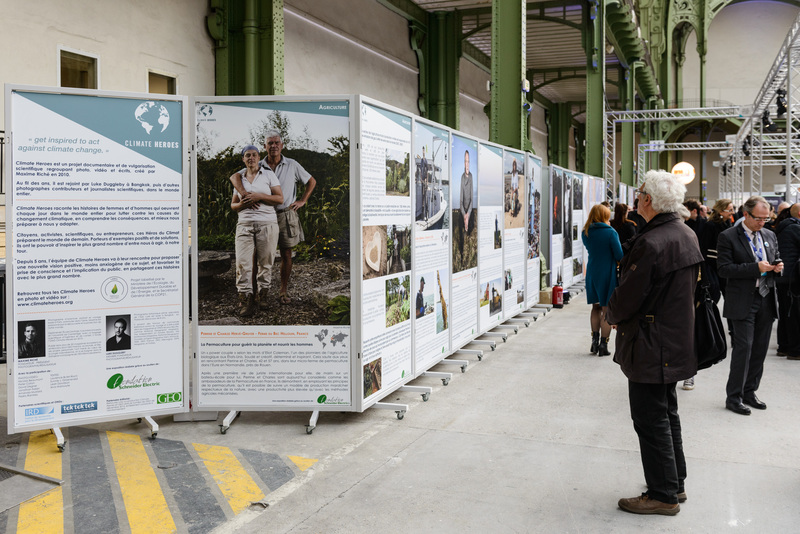 Une sélection des initiatives des Héros du Climat sera exposée au public en 14 panneaux dans la Nef Sud du Grand Palais, avec des textes et portraits à l’échelle 1. 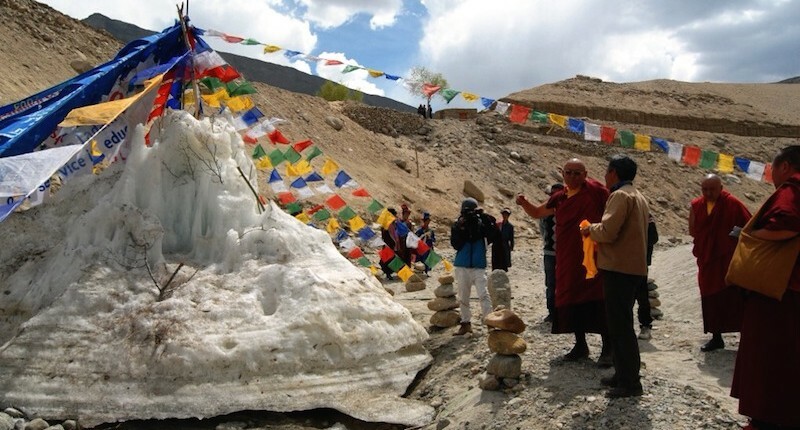 Cette exposition sera accompagnée de projections des court-métrages des Héros du Climat, tournés dans le monde entier et couvrant des thématiques aussi variées que l’agriculture, l’aquaculture, l’énergie, la fonte des glaces, la forêt, le transport, les villes, les déchets, etc. Samedi 5 décembre de 13h à 15h, vous êtes invité à la conférence Climate Heroes, avec le soutien et la participation du Programme des Nations Unies pour l’Environnement (PNUE). Mardi 8 décembre de 15h a 16h30 : aux côtés de Barthelemy Toguo, et avec ArtPort, il sera proposé un atelier Climate Heroes aux élèves du Lycée Maximilien Vox : Comment l’acte de création peut nous amener à prendre une part active dans la lutte contre le changement climatique. Maxime Riché proposera aux étudiants de s’engager en allant à la rencontre du public et réalisant des portraits de citoyens, qui agissent déjà à leur échelle pour inspirer le plus grand nombre a les suivre. Lundi 30 novembre et mardi 1er décembre : Maxime Riché interviendra comme modérateur et speaker au Transformational Media Summit et proposera une vision de nouvelles formes de Storytelling afin de mettre en avant les innovateurs climatiques. Rendez-vous à Place to B. (auteur de Ice Watch – http://www.olafureliasson.net/) et avec ArtPort. Maxime Riché réalisera des photographies de l’événement et des portraits des participants. Rejoignez nous pour une marche débutant à 17h au grand palais et se terminant à 19h30 sur le parvis de l’hôtel de ville. Vendredi 11 décembre, de 11h à 12h : atelier au Bourget avec la Fondation Nicolas Hulot, pour une journée spéciale thématique autour des forêts, en collaboration avec Envol Vert. Diffusion des films Climate Heroes autour de la préservation des forêts, et atelier/conférence à destination du public : Comment l’acte de création peut nous amener à prendre une part active dans la lutte contre le changement climatique. Climate Heroes is a documentary and advocacy media project gathering photos, videos, and texts with a science educational component, created by Maxime Riché in 2010. Along the years, he was joined by Luke Duggleby in Bangkok, and other contributing photographers and scientific journalists around the world. 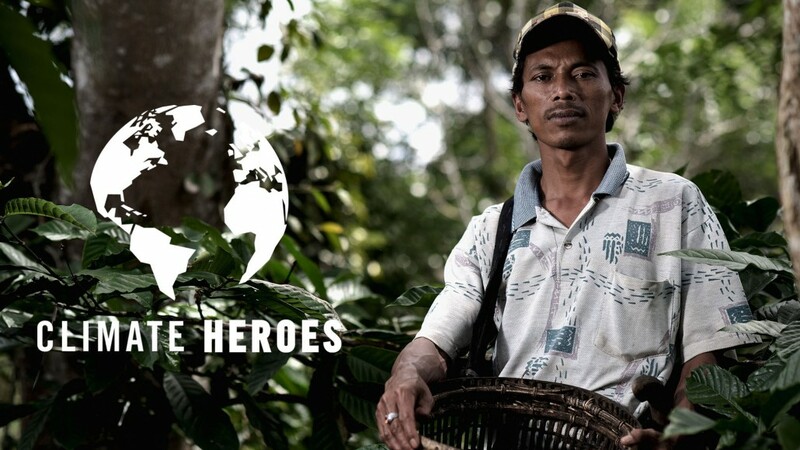 Climate Heroes tells the story of those women and men who work, every day around the world, in order to mitigate climate change, understand its consequences and allow us to be better prepared to adapt to it. Citizens, activists, scientists, or entrepreneurs, the Climate Heroes prepare our world as it will be tomorrow. By their positive example, they can inspire the great many to start acting now and mitigating climate change. For the past 5 years, the Climate Heroes team have met them to raise awareness and offer the public a more positive vision on climatic issues, provoke thought and foster behavioral changes. By doing so, we are carrying a strong and positive message. 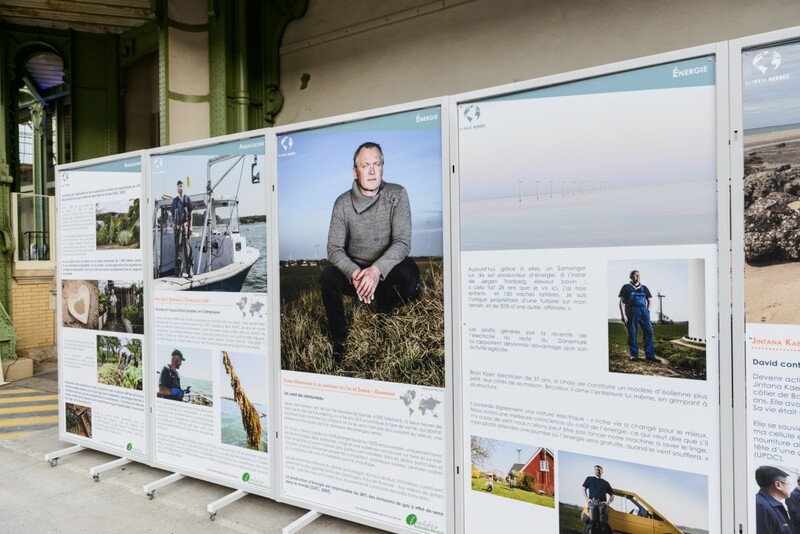 Maxime Riché is Artist in Residence at Grand Palais, with a Climate Heroes photo exhibition of 14 large-scale portraits and stories, in the South Nave of Grand Palais, with the support of the Schneider Electric Foundation. 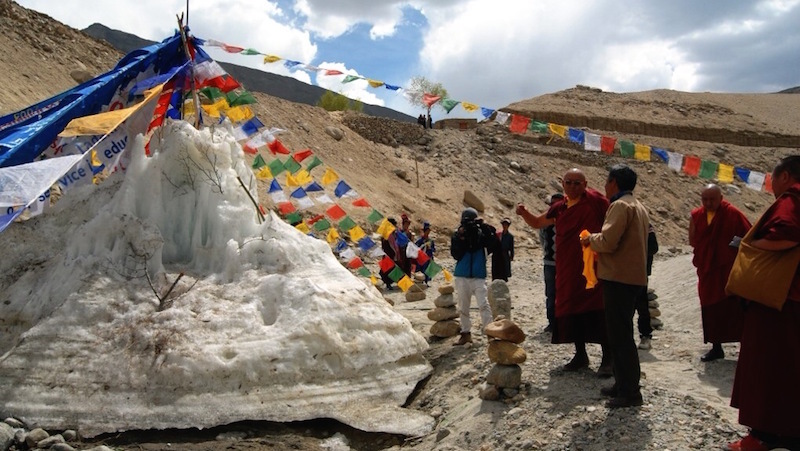 This exhibition will be complemented by the screening of some Climate Heroes short-movies, filmed around the world. Some of the themes include agriculture, aquaculture, energy, forests, housing, water conservation and adaptation, etc. Saturday December 5, 1pm to 3pm: you are invited to the Climate Heroes conference, with the support and participation of the United Nations Environment Programme (UNEP). Tuesday, December 8, 3pm to 4.30pm : alongside Barthelemy Toguo and with ArtPort, Maxime Riché will give a workshop to the students of Lycée Maximilien Vox : How the act of creation can bring us to take a more active part in the fight against climate change. He will propose to the students to get involved by meeting the public and making portraits of citizens, who have already started acting at their level, in order to inspire more of us to follow this lead. 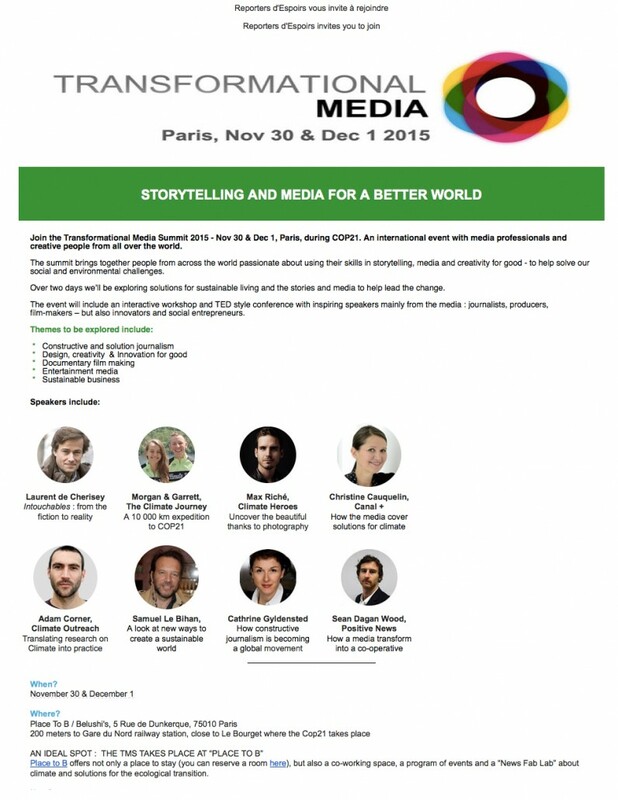 Monday November 30 and Tuesday December 1st : Maxime Riché will be a speaker and moderator at the Transformational Media Summit in order to offer a vision on how to invent new ways of Storytelling in order to showcase climate innovators. (author of Ice Watch – http://www.olafureliasson.net/), and with ArtPort, Maxime Riché will make photographs of the event and portraits of the participants. Friday, December 11, 11am to 12 noon : workshop with the Fondation Nicolas Hulot, for a special day around Forests, in collaboration with Envol Vert. Screening of some of the Climate Heroes short movies around Forests, and conference with the public : how the act of creation can bring us to take an active part in the fight against climate change. A few months back, Climate Heroes Founder and Photographer Maxime Riché was in NYC to give a speech at the UNFCCC reception at the Hearst tower, during the UNFCCC Climate Summit, at the same time as the NYC Climate March (more information on the original article here). We are now delighted to share the final edited video of the evening, slightly shortened to keep a decent size. This sorter version features the speeches of R.K. Pachauri, who has been serving as thechairperson of the Intergovernmental Panel on Climate Change (IPCC) since 2002, which was awarded the Nobel Peace Prize in 2007, as well as Wael Hmaidan, Director of the Climate Action Network, and Max Riché. The reception was hosted by UK Climate Change Minister (now Envoy on Climate Change) Greg Barker and Robert De Niro’s wife, Grace Hightower De Niro, at the Hearst Tower, a LEED Platinum-certified building at the corner of Central Park. Many Climate Negociators, artists, activists and journalists were present. Thank you very much BLJ Worldwide for organizing this event and inviting us to speak there! https://climateheroes.org/wp-content/uploads/2015/01/AddressingClimateChange_ClimateHeroes.png 677 1213 Max https://climateheroes.org/wp-content/uploads/2013/06/Climate_Heroes_Small.png Max2015-01-16 14:27:582015-01-26 17:26:29Climate Heroes leader Max Riché speaks at UNFCCC Climate Summit: Video is live!